I have been busy over the last week, and have been completely disorganised with my evening meals. The menu plan I set up for a fortnight came to an end on Sunday and I have not found the time to compile a new plan.I will get back into menu planning as soon as I can! My creative way with food does not sit well with the menu planning, however I found planning the meals very useful when organising the weekly shop. The major downside for me is using a list and sticking to it! Because I’m a really foodie, I have a tendency to buy on impulse, and think that a certain product would be nice to cook with. My pantry is full of items I’m going to use one day, like arborio rice, and vermicelli noodles! 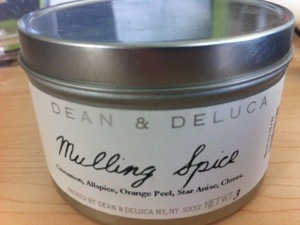 I even have mulling spice purchased from Dean & Deluca in New York over 2 years ago. It’s well past the use by date. Maybe my Food Tech student daughter can inform me whether the spice mix is still safe to use! Now, the promise to myself is to limit myself one “luxury” impulse buy a week! So yikes, I had to use fridge supplies and pantry items to create something in a hurry for dinner last night. Bridge lessons were starting at 7.30pm and needed to do something quick and easy. For those of us that live in Auckland, the weather is so hot at the moment and who really wants to spend a long time in the kitchen. I found some chicken breasts, made a quick sauce and served with pasta. I have used this recipe for many years. It is adapted from a recipe in the AWW, pasta cook book. My recipe uses a combination of cream cheese and sour cream, however you can just use cream cheese if you prefer. The sauce would also go well with fettucine or spaghetti. As a variation you could also add cooked bacon to the final sauce. Sprinkle paprika and pepper over sliced chicken breast, and set aside for 20 minutes. Cook the pasta according to instructions in plenty of boiling water. While the pasta is cooking prepare the sauce. Use a mini food processor to combine cream cheese, sour cream, parmesan cheese, pesto and water. Heat the butter/olive oil and then add the chicken breast. Cook until lightly browned on all sides. Add the cream mixture, and cook for another 2 minutes. 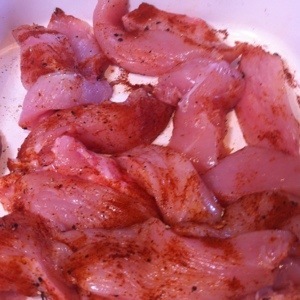 The maximum cooking time for the chicken breasts, if sliced thinly will be 5 minutes. If cooked too long, the chicken breast will be dry. 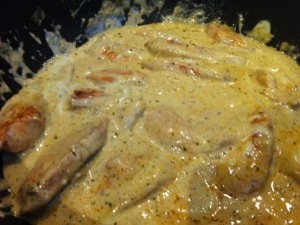 Drain cooked pasta and add to cream sauce and serve. 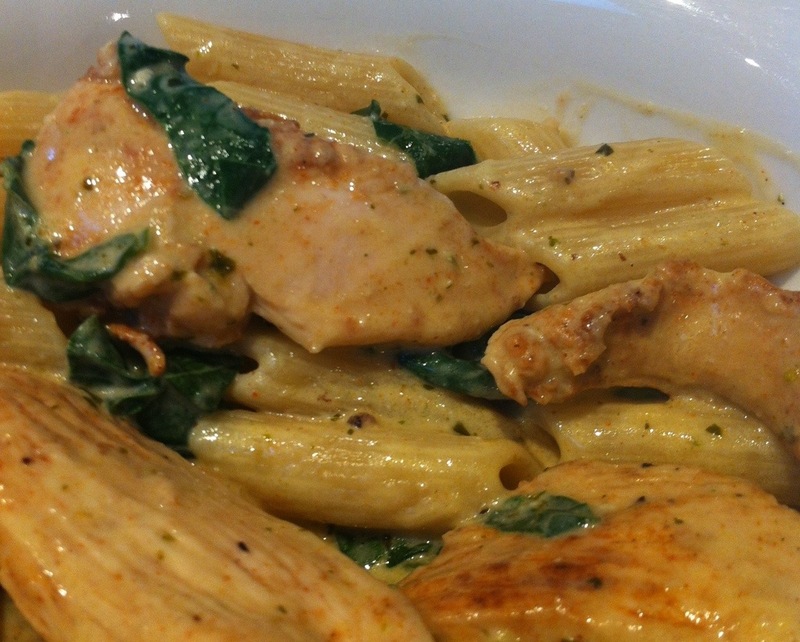 I added finely shredded spinach to the chicken mixture 1 minute before the end of cooking. Hi, the mulled wine spices will never go off they might just lose their pungency. You could use them to infuse red wine and then peel and poach whole pears-serve hot or cold. Delicious!! Thanks for those hints Norma. The Jamie Oliver recipe looks fab!